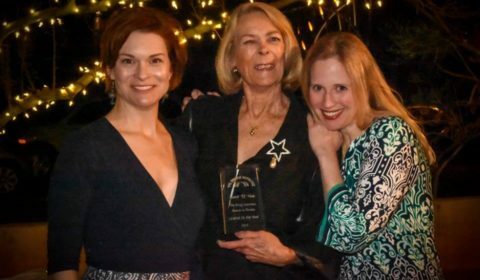 The Bridge Initiative: Women in Theatre was honored to present Evelyn Elaine “E.E.” Moe with our first ever Leader of the Year Award. The award was presented to E.E. at the 2018 Building Bridges Gala on February 24th, at the Scottsdale Stagebrush Theatre. We chose E.E. because, as a working professional female theatre artists in the Valley, she walks the walk, and has for decades. She is an actress, director, producer, educator, advocate. She founded the Megaw Theatre and Actors Studio in Phoenix and Los Angeles and has many working students here in the valley and across the country. She has a long working history of collaboration with playwright Elaine Romero whose work was presented at the Gala with a reading directed by E.E. Congratulations to E.E. for all her contributions to the arts and education here in Arizona and nationwide.